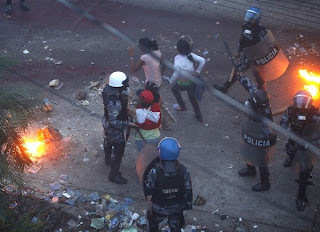 This is an urgent plea to Secretary of State Hillary Clinton: Immediately condemn the violence unleashed against the Honduran people by the de facto regime and take every peaceful measure possible to avoid a bloodbath in that country. The coup has deployed the police and Armed Forces to the Brazilian Embassy and launched a violent attack on the thousands of protesters gathered there to support President Manuel Zelaya. The repression has resulted in scores of citizens wounded and taken prisoners, and unconfirmed reports of two dead. The euphoria that erupted in Honduras yesterday with the appearance of the democratically elected President Manuel Zelaya in Tegucigalpa has rapidly changed to terror as the huge demonstration finds itself under siege. The Armed Forces took over the dispatch center of the electricity system this morning and cut off the circuits that supply electricity to independent media, particularly television's Channel 36 and Radio Globo—the most important outlets for information not controlled by the regime. Many cell phones are blocked, and all national airports have been closed to prevent the arrival of international diplomats and reporters. Observers fear that the coup is planning to order the armed forces to storm the Brazilian embassy. Such a blatantly illegal and violent act would convert the Honduran crisis into an international crisis of unprecedented proportions. The coup has cut off electricity to the embassy where President Zelaya is protected, and the embassy is operating on an independent generator. In a live interview at 9:30 this morning EDT, President Zelaya called on the entire international community to condemn the repression. He stated that he is safe for the moment, accompanied by embassy personnel and women resistors who managed to take refuge in the Embassy. "There is a regimen of terror in the country that should be attended to by the international community," he stated. When questioned about the possible siege of the embassy, Zelaya urged the international community to "act with firmness so the regime will not carry out this terrible crime." Meanwhile, coup leader Roberto Micheletti denied his responsibility for the failure of the San Jose pact and called for the immediate arrest of President Zelaya. Head of the Armed Forces Gen. Romeo Velasquez stated that the army will continue to comply with orders from the coup. Luz Mejias, president of the Inter-American Human Rights Commission, noted in an interview this morning that the Commi ssion is receiving "very serious reports of violations of human rights" by the Armed Forces. "We must establish the responsibility of each and every individual who issued these orders to repress protesters... The situation is very grave." She called for the restitution of constitutional order "because only the restoration of constitutional order will guarantee that the human rights of all Honduras are respected," and urged the return to power of the constitutional president "who has been received with violent repression." 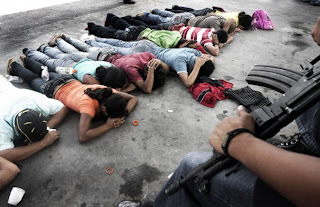 Mejias noted that the curfew, now extended to 6 p.m., is a clear violation of human rights and legal norms and affirmed that the individuals who ordered these measures must be charged under international criminal law. Faced with what many see as an imminent threat of siege on the embassy, Mejias noted, "If they forcibly enter the embassy, it will be a violation not only of human rights but of international law. Embassies are impenetrable and immune under the Treaty of Vienna... The Brazilian State would be in a very complicated situation. We hope that will not happen." She called for respect for the right to demonstrate and stated that the presence of the constitutional president in Honduras should be seen as an opportunity to enter into a dialogue that fully respects the human rights of Hondurans and assigns responsibility for the serious violations taking place under the coup. "Early this morning, military forces attacked those of us outside the Brazilian Embassy. There are no words to describe the brutality of the attack—they chased us, threw bombs, beat us and now are hunting down everyone who took refuge in the surrounding area. There are 65 of us, mostly women and children here; we are under siege, our telephones are tapped, there is a squad three houses away and they are making rounds searching for signs of life to burst in. We have very little water and no food, the tear gas has permeated the atmosphere and our eyes and noses are irritated. Some of the women have been taken prisoners and according to the last communication they have been taken to a stadium called Chochi Sosa. The electricity went back on recently and so we are able to send this e-mail. 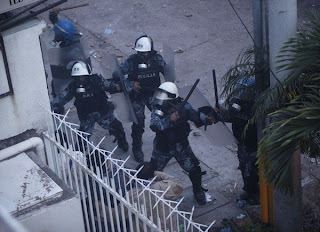 We can hear the military movements outside, the cars, helicopters, bombs, shots, clashing of metal, stomping of boots, sirens and in a cruel joke on all Honduran citizens they are playing the national anthem at full volume over and over. "We call for support for all the people who are being protected by Feminists in Resistance and for the compañeras who are doing everything possible to get us humanitarian aid despite the fact that the armed forces won't let anyone through, not with medicines or food or anything. We're completely isolated; we want everyone to contribute by denouncing the violation of basic human rights being perpetrated by the military forces of the de facto regime." Sec. of State Hillary Clinton cannot call herself an international advocate of women's rights while ignoring the plight of these Honduran women who are a worldwide inspiration for feminist organizing in the fight for democracy. She cannot call herself a representative of U.S. values abroad while turning a blind eye to the brutality and illegality of a coup regime crazed by power and isolated among governments for its lack of respect for the rule of law. Clinton continues to make statements divorced from the current dire reality in Honduras. In a meeting yesterday with President Oscar Arias she stated, "...we have certainly communicated very directly our expectation that there will be order and no provocation on either side. This is not just a one-sided request. It goes to both sides. Both sides have supporters who need to be restrained and careful in their actions in the days ahead." Today the reality is that the Armed Forces under the coup regime are carrying out not just a "provocation" but a brutal attack on protesters. 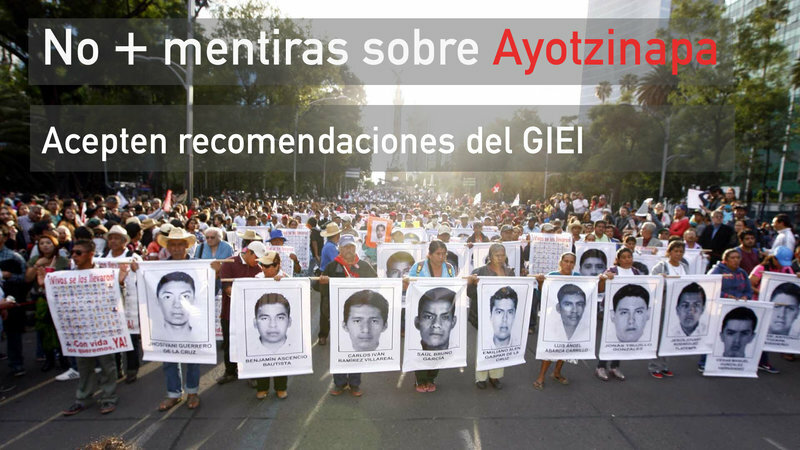 Yet the images, the testimonies and the news reports are still being ignored by the U.S. government. The U.S. government must issue a firm statement in defense of human rights and the strongest possible message to the coup to desist in its attack on the Honduran people and the constitutional order. Act today to insist that the US State Department speak clearly, honestly, and urgently about the explosive situation in Honduras. So in order to avoid repression, the heroic resistance fighters broke into and looted stores and banks, and broke into peoples' homes and terrorised them. Is that how you avoid "repression"? "Repression" can be clearly seen in the post above. This is documented by human rights organizations. There are also numerous firsthand reports that it is the army that is breaking into and terrorizing people in their homes--in neighborhoods in Tegucigalpa and other places throughout the country. You are more than welcome to present real evidence of "repression" by resistance movements--until then unsubstantiated accusations that contradict on-the-ground reports do not help to advance the debate.